<> on August 12, 2017 in Charlottesville, Virginia. Four alleged members of a militant white supremacist group have been charged with inciting rioting and assaulting counterprotesters at last year’s deadly rally in Charlottesville, Virginia. Prosecutors described the men as “serial rioters” who attend political rallies to engage in violence against those who disagree with them. 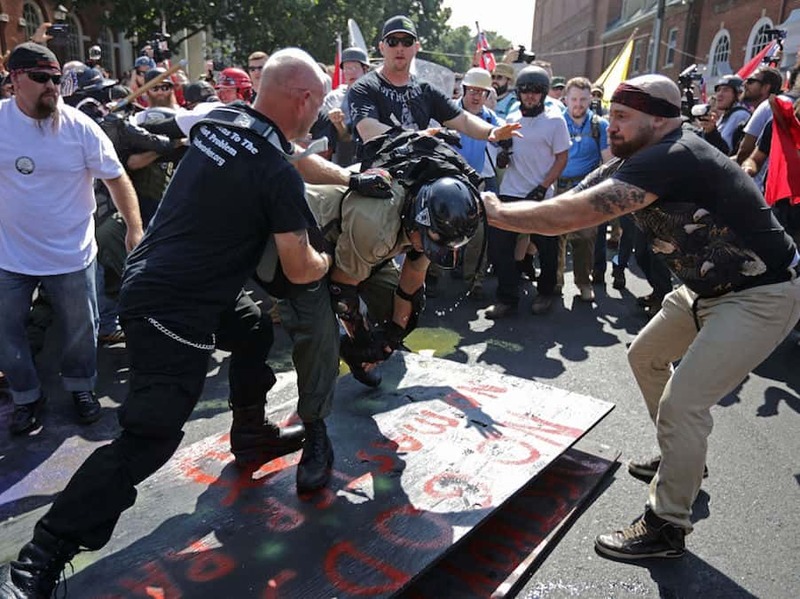 Rise Above Movement members openly identify themselves on social media as “alt-right” and “nationalist” and frequently post videos and photos of themselves in public parks performing physical training and mixed martial arts street-fighting techniques “in order to prepare to engage in fighting and violence at political rallies,” the complaint said. The group espouses anti-Semitism and violence toward those who “hold opposite ideologies to their own,” according to the complaint, which includes numerous photos of the defendants engaging in violence at rallies. Three of the defendants appeared in federal court Tuesday. It’s unclear whether they have attorneys. “The four individuals arrested today traveled from California to Charlottesville to incite a riot,” Tom Chadwick of the FBI said at a news conference. On their way to the Unite the Right rally in Emancipation Park, Daley, Miselis, Gillen and White had “with their hands taped and ready to do street battle, committed multiple acts of violence, including punching, kicking, headbutting and pushing numerous people,” Cullen said. The four men arrested are not implicated in Heyer’s death.